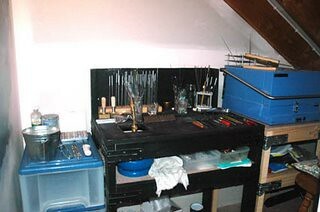 Have you ever wanted a list of things you need to start a lampworking studio? I am here to try to give you a complete list, with links on where you might find such items. Note, the links I provided are of various suppliers and I don’t recommend one over the other. First things first. You will need a torch. A lot of people start off with a hothead torch. This runs off of strictly propane and is pretty inexpensive, costing about $30. Many, many people start here, but the hothead is not very hot, despite it’s name and it takes a long time to melt glass. You can get a complete starter pack using a hot head here. Cheap at $100. It doesn’t include a kiln though. But enough basics to try it out anyway. Never, never sell beads that have not been annealed. What torches most of us use are are duel mix oxygen/propane torches. Popular beginer torches are the minor, betta, and lynx. If you get a duel propane/oxygen torch you will need an oxygen source. Either a concentrator or you’ll need to buy or rent an oxygen tank. If you go with the oxygen tank you’ll need an oxygen regulator. You will also need a propane tank and a propane regulator. We use a BBQ tank sized propane tank. Also hoses for your oxygen source and propane source. Glass. 90 coe, 96 coe, 104 coe, or Boro Please do not mix the coes together. The glass will explode! Tools. Everyone picks and chooses their own tools and some make their own, using butter knives, exacto knives, and razor blades. This list is just the basics you need to get started. many of us have tons of different kinds of glass and tool swe have collected over the years. I would love to have the perfect studio…currently I share space with my other business (book design) and my 15-year-old daughter’s study area (hmmm…it is not heavily used so I may appropriate it back). In any event, it’s crowded. I forgot to mention two other “coworkers”: the Greyhound sprawled under my desk most mornings and the Maltese who gets into the most unlikely nooks and crannies. Let’s back up. My office/studio is what would have been the third garage stall when we built our house 18 years ago. It’s long and has one big window at the front. Both sides are lined with either bookcases or computer equipment. And it’s a mess. Seriously. I work best with all my book design projects spread out (otherwise I forget about one or the other since I juggle a dozen or so any given week). 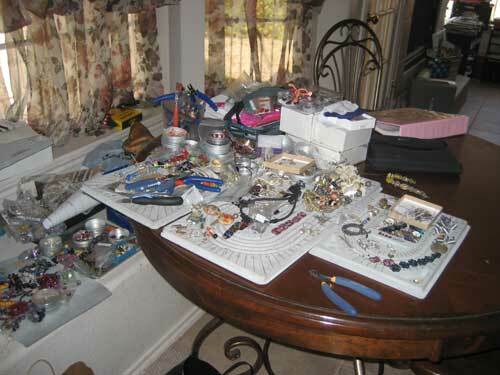 Similarly, I work best on jewelry when I have many projects underway and supplies spread out. 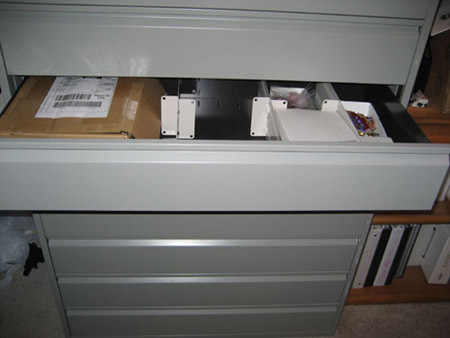 And a year or so ago, I inherited a very cool printer’s type file cabinet…8 drawers, each 6″ tall. 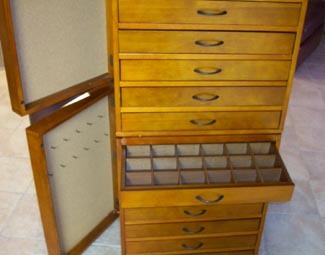 (see below) Perfect for storing beading supplies! There’s the silver drawer, the lampwork drawer, the pearls drawer, mailing/packaging drawer…you get the picture. And one other worktop/drawer combo that has fallen prey to clutter and “stackage”. So if you are keeping up visually, you are probably wondering how the heck I can do any jewelry work in a space like I described. The reality is I don’t anymore. I have a lovely bead rack to be able to view my favorite collectables and I have an area that I can fondle and gaze at newly acquired beads and supplies, but I actually leave this area now and move to the kitchen table to create. The light is better, the TV is out there, my daughter is usually out there, and I have room to spread out. Picture a windowseat and a round table for 4, both half-covered with supplies. Three or four beading trays with various projects, findings, beads, tools, inspiration. Where do we eat if I have taken over the kitchen table? At this stage of life, my husband is gone 5 or 6 days a week traveling on business, so meals are non-traditional at best. There’s room for my daughter and I to sit at the table and I can stack a bit to fit a third person. It used to bother my husband after a few weeks, but the reality is more jewelry gets made there than family meals so he’s gotten past it. We use the dining room if we have more people and on the occasions where we are entertaining, I stack everything carefully and use one of the cabinet drawers to do a mass “hide”. I have to see what I’m working with, or even what I’m not working with, because I might want to work with it. It works for now and lets me stay more central to my family. Some of my friends have the most beautiful studios imaginable — one even has one so amazing that a magazine wants to cover it as a feature article. Me, my studio is my kitchen table. I have a five-year old son and a wonderfully supportive husband, and we spend our time in the family room. The family room/eating area/kitchen all are one big room, so it was second nature to set up shop right in the middle of it. That way, I could design and make while still being with my family. My beads are stored right behind my chair, in a Collectors Cabinet — very handy! I also have an office — it used to the formal living room, which we never used as such. I do all my computer/web work here, as well as take photos, manage shipping, and all that behind-the-scenes stuff that takes up TOO MUCH TIME. 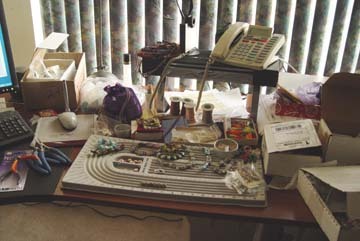 So we have the computer desk — notice the photos on the screen, waiting to be uploaded to the web site, a stack of postcards to be mailed to customers, the huge pile of receipts waiting to be entered into QuickBooks…..
Then we have the photo “studio” — the big bowls hold bags of jewelry waiting to be snapped…. And then a bookshelf full of bead catalogs, a calender to record events, a postage scale, and a trash can that never seems to be empty …. And there you have my studio! 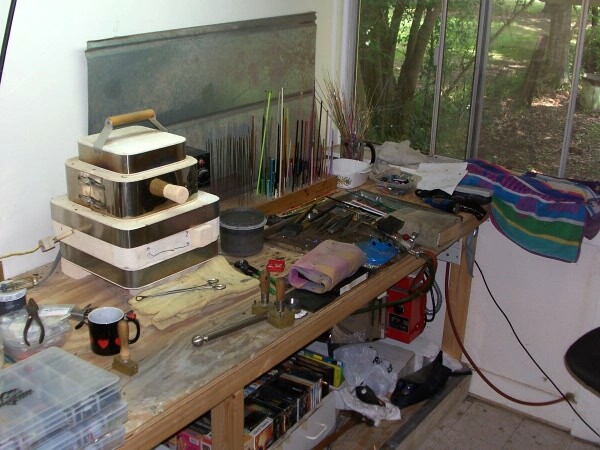 We’re working on making my glass and metal studio, which is separate from the house, a bit more hospitable – an air conditioning unit is a MUST this time of year! But I really like my studio being in my house. I don’t miss out on family time, and I can work on something without having to drive to another studio. It’s a mess, but it’s home. Years of apartment living and juggling the needs of a family of six have taught me a few things about clutter. It seems like the cardinal rule is to not make it in the first place, but unfortunately, I am a clutter bug by nature. I am doomed to expand to fill the whatever space I am given. One important lesson that I learned at our last apartment was that creating an organization system that doesn’t work with my style will result in failure every time. Armed with that knowledge, I set up my first studio by creating zones that fit my work style while focusing on keeping the most-used items readily available. Another important organizing truth I learned is that all the baskets, bins and shelves in the world won’t work if I have too much stuff for my space. Furthermore, it’s important to think about what I need to organize and the space I have for it before buying nifty widgets to hold my stuff. A closet or shelving unit holds a finite amount of matter. Rubbermaid totes can only be stacked four or five high before they hit the ceiling or toppling over. If it reaches that point (ideally before then! ), it’s time to downsize. I have promised myself that if I find myself thinking “I need another tote,” I will stop and sort through what I have and donate some of it to charity. My current studio has four main areas: the closet, the sewing table, the “extra” desk and the computer desk. For the most part, these zones are working well, as long as I make a point to keep on top of things. I’ve come to realize that one of my biggest time wasters is spending an hour cleaning up the mess that I’ve let accumulate for two weeks, instead of spending five minutes a day tidying up. The closet contains my completed inventory, bins of fabric, scrapbooking supplies, yarn and other random detritus including an old iMac and wrapping paper. It also serves as the hiding place for holiday gifts (and chocolate). Most importantly, there’s an organized area for my shipping supplies. I re-purposed hanging closet shelves from a previous home to contain envelopes, bubble mailers, tissue paper, a postage scale and boxes. Having a designated spot for these items simplifies the shipping process and encourages me to always put the shipping supplies back where they belong. My top priority is keeping the sewing/cutting table clear. If I allow things to pile up on it, I have no hope of working efficiently, or even of being inspired to sew. The cutting mat is always on the table and I place my sewing machine on top of it. Underneath the table, there’s a conveniently placed bin for scrap fabrics. I recently admitted to myself that I will never be able to use all of the scraps and started donating some of my scraps to collage artists and other crafters (including my children). We had planned to set up a second computer on the extra desk, but my fabric addiction quickly gobbled up the available space. The desktop is currently being used as a staging area for creating market totes. 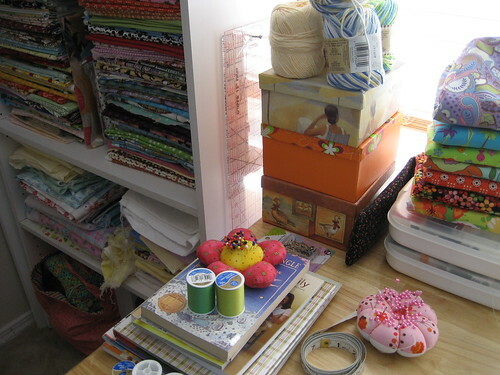 The fabric is organized in stacks, but my current goal is to clear off the top of the desk so that my children can use it for their creative endeavors. Meeting this goal will require a lot of sewing in the next few weeks or getting rid of some fabric that I am not likely to use. In actuality, I will probably use a combination of the two to tackle it. My desk is usually a disaster area. It’s covered with the computer, printer and electronic gadgets; to-do lists and love notes from my children; coupons, menu planners and grocery lists; a plastic drawer set for bills, stamps and address labels; a wire bin for random bits of paper I can’t part with; homeschooling materials and assignments; a stack of CDs; hair bobbles and assorted toys that the children leave behind when visiting. I keep a shredder and recycling bin at the end of my desk and I use them every day. I do try to clean the desk every week, but it’s one area that I have decided is mostly hopeless, and that’s okay. The third, and maybe the most redeeming, lesson I’ve learned while battling the clutter bug is that taking baby steps is acceptable. My studio doesn’t have to be perfect. I didn’t accumulate my stash overnight and it took years for me to realize that my bad habits were holding back my creativity, and it will likely take me years to streamline my space. While I am still tempted to do an extreme makeover, I know that it would be wasted time. In the long run, focusing on one or two areas of my studio and creating systems that truly work will improve my productivity. Andrea Quenneville blogs at Thoughts from Ms. Q. 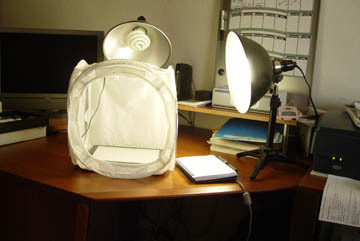 One thing about my workspaces, including the studio, that I’ve noticed is how easily they become completely unusable. I tend towards creatively organized chaos, but there’s only so much floor space I can “organize” things on. Eventually just walking into my studio is hazardous to anyone’s health. At the beginning of this year I decided I needed to organize my studio in a way that makes me want to keep it so. This required three things: time, help and lots and lots of clear plastic boxes. I cleared an entire weekend from Friday night to Sunday night. Nothing else was planned, the husband’s schedule was partially cleared, phones went unanswered and Netflix movies unwatched. I enlisted a friend of mine, Abby, who is an aspiring professional organizer for the help but also the motivation. I would not have been able to even begin without her. Just looking at the door to my studio would send me running in the other direction. Abby gave me instructions before I started to get as many clear plastic boxes as I could. The contents would be easy to see and my supplies wouldn’t be difficult to locate. So the fun began. Because my living room was relatively clear of everything except furniture, we used it as a staging area. Everything went out of my studio into piles on my living room floor. Since I make a variety of things, I needed to separate my supplies based on their purpose. Once everything was cleared and separated, we set up my studio furniture into four stations – bookbinding, sewing, cutting & everything else. Once we decided where these stations were, we could start putting my supplies in boxes and placing them near the appropriate stations. The before and after photos are proof that a bit of work and some planning can turn complete chaos into a usable, organized and calming environment to work in. I still have a bit of decorating to do – painting walls, hanging shelves & artwork, but it’s a pleasure to create in my studio now. The luxury of a studio is something we as artisans or artists all desire and most of us manage to some degree. I would love to have a studio that is free-standing, with masses of storage, a display area and somewhere for clients to visit and make their purchases. In the meantime I am content with my half of the study/workroom that I have to share with my husband, the children and our farming business. However, I am making a good attempt at taking over this room completely. I have one wall dedicated to my work bench above which is shelving for my stones and for my books. As I have to share, however, it isn’t big enough for all my things. The opposite wall also has some shelving and I have managed to snag about a third of that for storing my display equipment. We have a long banquet sized table in this room that is purportedly for my husband to use. I have managed to cover two thirds of that with boxes filled with stones and pearls. The family computer is also in this room, however I spend the most time on it and feel it is in ‘my’ space. As this room is part of our house, my torch is set up down in my husband’s shed. My ‘studio’ is a great space to work though. The room is usually a good temperature, it is large and the light during the day is good, even though it doesn’t get any direct sunshine in through the windows. All these things add up to me liking to be in there, which is great for productivity – although not so good when it’s time to stop. I see clients in either my dining room with its excellent natural daylight for viewing finished pieces, or they like to sit with me at my bench, while we work out their designs. The drawback of course is that I have to have a very tidy house all the time – just in case I have clients come to call. As anyone with younger children would know, this is often a challenge. My Studio is……a cupboard. Yep, basically a cupboard. A very large cupboard, but definitely a storage area. It is a cute little room, snuggled up under the eaves on the second story of my house. When my friend’s young children first saw the matching rooms (before one became my studio), either side of the ‘parents retreat’, they declared them Harry Potter bedrooms, and claimed one each.I used to torch outside in my husband’s cedar workshop. I had to pack everything up after every torch session. Yes, I did say everything. In winter it was freezing, and as it was right up the back of our garden, even getting up the enthusiasm to trudge up there in cold weather, or worse, late at night (it’s spooky out there!) was an effort. 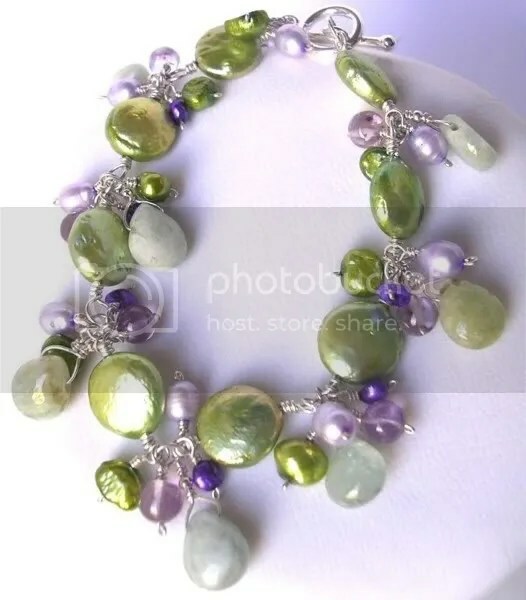 It was pretty spacious, so when it was my turn to use it, I could even have several torches set up at a bead meet, but if that arrangement had continued, I never would have been able to grow in my glass work as I have done. We decided to move me into the house. Jason built me a wonderful custom made work bench, and another for my kiln and I moved in. Ventilation was problematic for awhile. I’m not exaggerating when I say it’s a cupboard, so with no external windows, and only the open door behind me for ventilation, the use of enamels, metals, even reichenbach frit was outlawed. 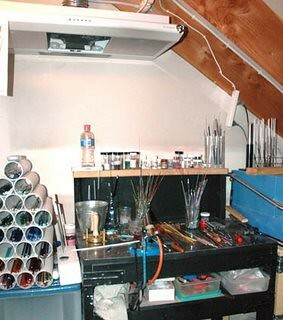 The fledgling studio – before the days of ventilation and a ‘big girl torch’. So, now I can torch for as little as an hour or as long as I like, without worrying about sharing the space, the ambient temperature (heck, if its really hot I just turn the aircon on in the bedroom behind me) or the time of day. In fact, part of the initial impetus for the move was the plan to put my insomniac tendencies to use by torching in the wee small hours when I can’t sleep. So, even though Jason jokes he banished me to a cupboard, it’s a very nice cupboard and I am quite happy here!